If any couple can be blamed for unrealistic Hollywood notions of true love and eternal happiness, it's Nelson Eddy and Jeanette MacDonald. The two popular singers embodied an irrepressible optimism about life, love and the happy ending. Utilising their warmth, natural charm and sweet voices, they sang and acted their way through a series of films that played heavily upon the emotional strings of viewers. In the 1930s, when the world was less cynical about such things, these two were a huge box office draw. Via beautifully contrived and poignant plot lines, they had audiences dabbing their eyes and leaving the theatre with an uplifting view that there might be hope for the human race after all. Even today, it's hard to resist them -at least for anyone with the remotest flicker of romantic yearning. Before the Nelson/MacDonald screen union, MacDonald was a Broadway musical comedy star and had already made several Hollywood films, starring alongside various male leads, including Maurice Chevalier. Eddy was a newcomer, a handsome baritone who had come from the Opera and concert scene. Their first film together was at MGM in the deeply charming Naughty Marietta (1935), a story drawn from a Victor Herbet Operetta. 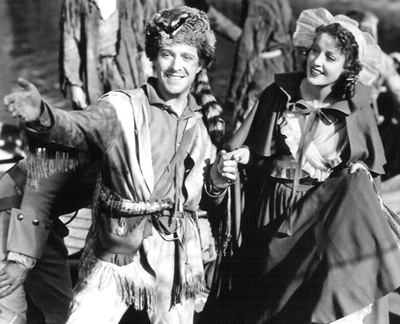 The film was a fairytale-themed romance interspersed with songs, in which Eddy played a Captain, Richard Warrington, based in colonial New Orleans and MacDonald a Princess on the run, disguised as her French maid Marietta and who is ultimately rescued from pirates by the dashing Captain. Naturally they fall in love. The pair's on screen chemistry bubbled with an appealing frisson - their hair was curly and their teeth pearly. MacDonald's wholesome good looks, humour and feisty personality played well against Eddy's gentle but manly charms. Naughty Marietta won an Oscar for best sound and a nomination for best picture - critically and financially, it was a success. More films followed, including the adventure classic Rose Marie (1936), which featured the song Indian Love Call and left the Canadian Mounties with an enduring image of romantic manhood and Maytime (1937). Both films were among the highest grossing films of their year and Maytime the highest grossing world-wide. After Maytime the screen couple split for a time; MacDonald had married actor and composer Gene Raymond which was the catalyst for the separation but as neither of their solo careers fared as well as the paired efforts, they reunited for the studio's first technicolour feature, Sweethearts in 1938, which was another triumph, winning Photoplay's Best Picture of the Year. Broadway Serenade followed in 1939 but MacDonald's performance seemed a little lacklustre - some hopeless romantics have suggested it might have been because Nelson Eddy married during the filming. Hmmm..
After some solo projects Eddy and MacDonald teamed up for yet another film in 1940 - New Moon, another adaption of an operetta and in 1942 they made I Married an Angel . It was to be their last together, however they did appear together on radio for several years.. Although they had plans to make more films, they never materialized. On screen at least, the 'singing sweethearts' had finally separated. Of course the films are shockingly sentimental by today's standards. Perhaps the most poignant thing of all about Jeanette MacDonald and Nelson Eddy is that such characters would never exist in films today. Most of us are just a bit too sceptical and a tad jaded to accept the premise of a perfect romance wrapt in earnest love songs....and even if we could, we probably wouldn't admit to it. Bah!